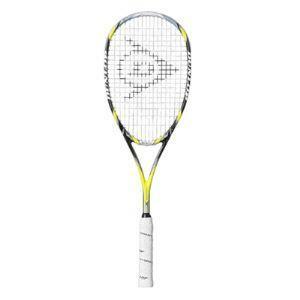 The Dunlop Aerogel 4D Ultimate Squash Racket is ideal for advanced/intermediate players seeking a head light pro player frame profile with dense 16x19 string pattern, widened throat area and long handle for ultimate feel and control, coupled with an oversize head to deliver maximum power. As Used by Amr Shabana. Aerogel 4D - 4D stands for 4 directional braiding and is constructed using four braided fibres of superlight S-glass fibre wrapped in an aluminium alloy sheath. The fibres are aligned at orientations which enables stresses to be supported in multi directions whereas standard carbon sheets are only orientated in one direction. This means that one layer of 4D material has the equivalent properties to four layers of standard carbon. 4D material enhances stability for increased control and enhances stability for increased control, touch and feel.